Outfits was recorded January 16 & 29, 2001 at Heat Records Recording Studio, Woodland Hills,Ca. It was produced and mixed by Tommy Lockett. 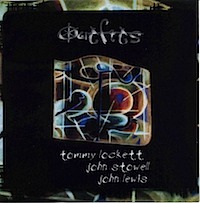 Outfits features the great jazz guitarist John Stowell, drummer John Lewis, and bassist Tommy Lockett. John Stowell has a voice on the guitar that is truly his own. I was a big fan of John when I was at Berklee, and later when I was on the road in the early 80's I met John in Portland Oregon, at the club he was playing, with the great bassist David Friesen. Years past and I meet him again in Los Angeles and we began to play together. I asked him if he like to play with my friend John Lewis, and what you hear on this album is that experience. Many Thanks to John Stowell and John Lewis for their great inspiration to music.